Two adopted kittens from our Brisbane Warra Shelter help complete the ‘Brady Bunch’ ! When Jenny and her partner decided to move in together and merge their families, you would think their home would be busy enough with four children and a very cute Chihuahua called Pebbles. But after her beloved Border Collie passed away not long ago Jenny knew she wanted more animals in her home. Also she was concerned that once her busy household had finished holidays and were back at school and work , that Pebbles may get lonely. “I thought that a kitten may be good company for Pebbles once we go back to work. When we are all out for the day they will have each other,” said Jenny. 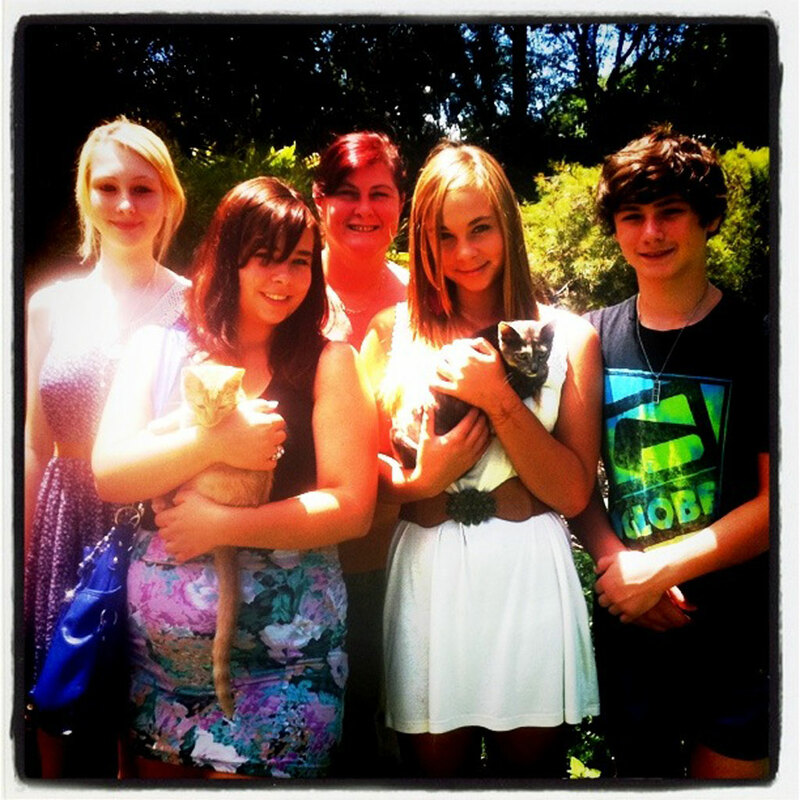 Jenny and the kids set off for The Lost Dogs’ Home’s Warra Animal Shelter in Bracken Ridge to adopt a kitten, with strict instructions to everyone that they would only be adopting one! However, when Jenny and the kids saw the kittens they have called Giavanni and Ava together they knew they had to take both. There was simply no question about it. “The kids didn’t even have to beg or ask to get the two kittens, when I saw them it was just a natural thing to adopt them both,” Jenny said. Jenny and the kids then had to set up for their two new additions and were immediately out buying scratching poles, toys and all the necessary equipment to welcome two playful kittens into their home. However, such a rush may not have been necessary as Giavanni and Ava soon discovered the Christmas tree! “She isn’t exactly playing with them but watching their antics and giving them the occasional sniff,” Jenny said. In all Giavanni and Ava have been wonderful additions to the family and are bringing everyone lots of pleasure and entertainment. It is already a busy household so two more kittens haven’t created that much more work. “We all love our animals,” said Jenny. All kittens, cats, puppies and dogs for adoption can be viewed on our website here.